Arrived Bangkok for the third day, looking for delightful desserts. Occasionally discovered The Brix, which located at Siam Paragon (BTS Siam station). Siam Paragon is one of the most deluxe and popular shopping malls in central Bangkok. The seating and environment in the Brix was very open, and you could just enjoy some tea and dessert with the friends after all day shopping. Highly recommend the fluffy pancakes. Arrived Bangkok for the third day, looking for delightful desserts. 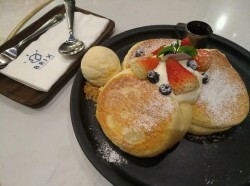 Occasionally discovered The Brix, which located at Siam Paragon (BTS Siam station). Siam Paragon is one of the most deluxe and popular shopping malls in central Bangkok. The seating and environment in the Brix was very open, and you could just enjoy some tea and dessert with the friends after all day shopping. Highly recommend the fluffy pancakes.